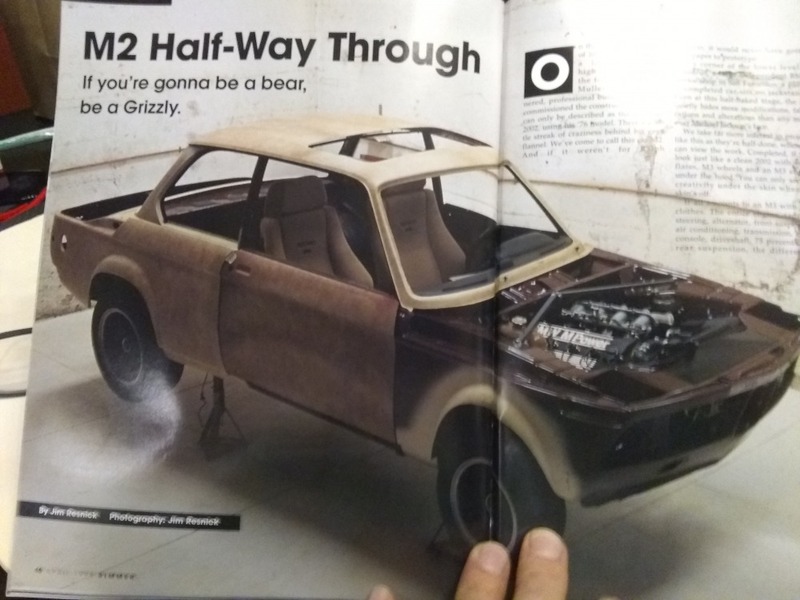 It's basically an entire e30m3 shoe horned into a 2002, like including the power steering and rack and the AC. M3 brake master, pedals hung from the top. Front subframe with brakes, strut tops relocated back so the castor is correct for the m3 suspension. Rear subframe with suspension and brakes from the m3, including the diff. And so much more. It was featured in the first issue of Bimmer magazine, April '98. 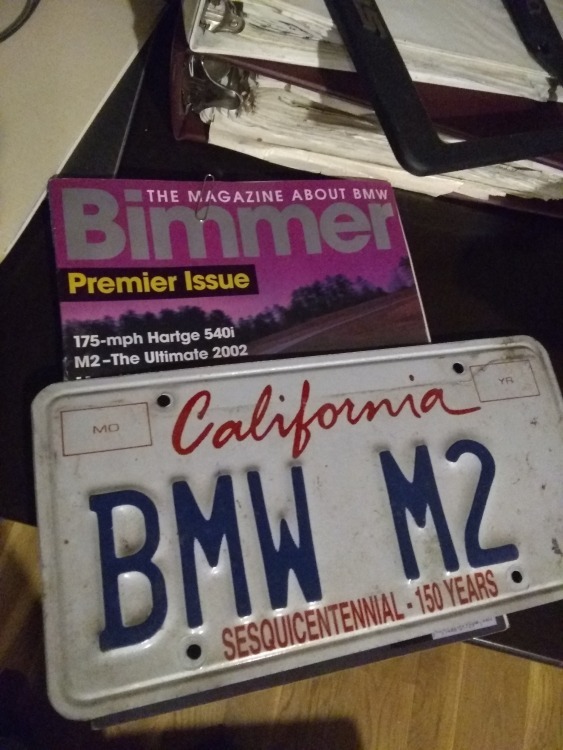 Oh, and those are the plates for it, from CA, BMW M2. They never finished it? or was that 'finished'? How does it drive? I assume that they managed to get it to running and driving stage at some point if they swung a magazine article about it 20 years ago. Get yourself a blog open and we will get the beers. Nice! Flares are awful though. Waiting for pictures of current state. I have that issue and remember that article. Yeah, blog for sure. The flares are awesome- they cut the sheet metal into fingers, bent them up and welded them together. Honestly, it could have been MUCH worse. I've been looking through the boxes of notes, receipts and pictures- guy had over 700 hours of documented (paid) labor into this thing. Guy that did the work re-engineered everything trying to make it absolutely right- really impressive. There are 8 or 10 inches of binders with notes and a USPS large flat rate box of actual pictures. I'm not sure of the plan right now- I'll get some new tires and change the fluids. It needs door gaskets and trim by the front windows. I need to look at it and understand it more. They were trying to remake the m3 inside the 2002, so they brought most of the m3 wiring harness to go with it. Not what I would have done, but it wasn't my car until a couple of days ago. It's interesting; I have really come to appreciate the spartan interior of the 2002. This car has much more of a cockpit feeling- large center console with HVAC, radio, gauges. AWESOME! Nice find. Love it, drive it! Nice car...... How much did it cost? 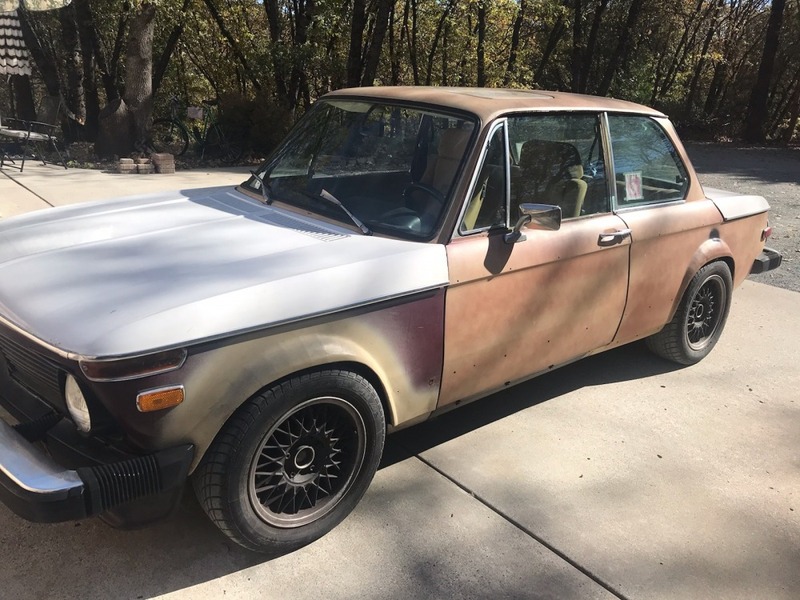 A lot, but the price was such that I drove from CO to CA to pick it up... We'll have to see what needs to be sorted- it has a couple of issues so far from a shake down drive this morning when I met up with JimK down in Loveland... Needs some sound damping for sure- it's loud. Hmm, I don't know that I dig the partial guidecoat look. ...so maybe I'd get it all into guidecoat? is FAR easier to do! Need to get it ready for the MidAmerica02fest. Blunt and Terry's guys will be all over it, say'n "Nice"